The Doepfer A-166 Eurorack Dual Logic Module is a Eurorack dual logic module, with 3 inputs with AND, OR and EXOR states, and inverted fuctions available via 2 inverters. The logical states of the inputs ("1" = high / "0" = low) are linked together in 3 ways: AND, OR, EXOR (exclusive OR). The three functions are available simultaneously at three outputs with LED display of the output states. Additionally two inverters are available to obtain the inverted functions NAND, NOR and NEXOR. The sockets of each triple unit are "normalized", i.e. the switched contact of socket 2 is connected to input 1 and the switched contact of socket 3 is connected to input 2. Provided that no plug is inserted into socket 1 resp. socket 2 the socket is connected to the input above it. This simplifies the usage of the module when only 2 signals are combined. E.g. the logic functions AND and OR have different neutral input levels ("1" is the neutral state for AND, "0" is the neutral state for OR). In case of a fixed input level for the unused input one of the functions (AND or OR) would work no longer. Applications: combination of digital signals of the A-100 (e.g. gates, clocks, triggers), e.g. to obtain "gated" clocks or certain rhythmic patterns. A-166 opens up new possibilities for interesting structures. 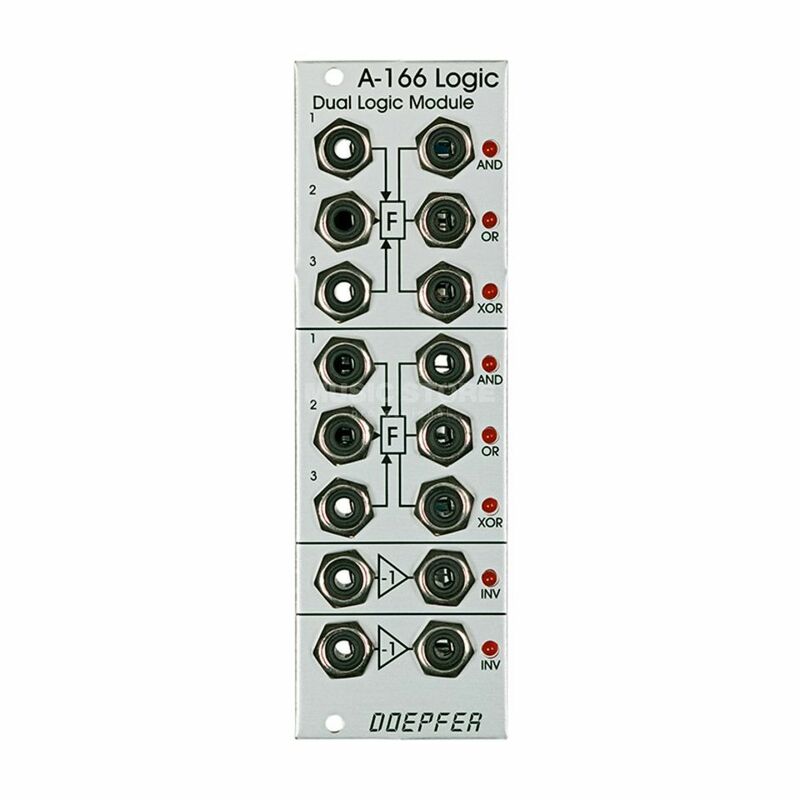 Static LFOs and clocks can suddenly be turned into interesting patterns, song structures emerge... After experimenting with the offerings by Pittsburgh Modular, Intellijel and Ladik I have decided to get Doepfers A-166 and its precisely what a logic module should be. The inverter is also super cool!